People are so keen to buy a designer £1000 Blackberry Bold that there is actually a waiting list for the device in Selfridges, even though the customised version costs £550 more than it normally does. “Customers have not been perturbed by the £1,000 price tag” according to Selfridges. The Bold 9780 on sale has been augmented with coloured leather from fashion designer Bill Amberg – with what is essentially a new panel on the back and a nice leather case. There are six colours available and there is a limited run of ten in each. 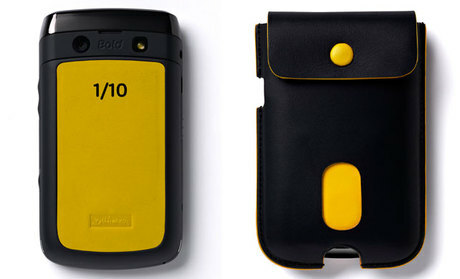 The case and leather outer are individually numbered, we like the yellow one above. If you didn’t get hold of the Amberg phone and fancy something a little more blinging, Selfridges have a series of blinging Vertu phones, which start from £3,500. Apparently, demand for its £5,900 Constellation Quest (with sapphire keys) is still strong following last month’s launch. All phones offer Vertu’s famed concierge service and international keyboard options. We’re not sure about the handset features..